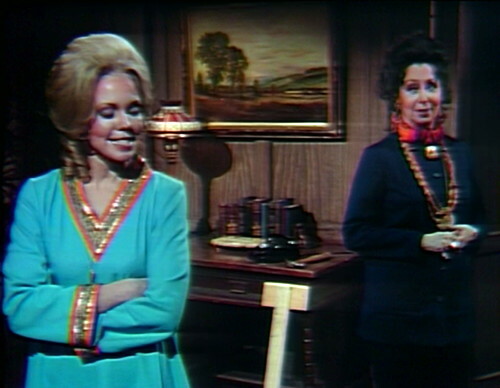 Today’s episode of Dark Shadows begins with some people in Parallel Time talking about the Parallel Time room, where they’ve just seen some people from Parallel Parallel Time, i.e. whatever the opposite of Parallel Time is. Mainstream Time? The Curtisverse? Is there any kind of fan consensus on what to call whatever time it is we’re usually looking at? Anyway, this is Parallel Quentin talking to Non-Parallel Barnabas, the dimension-hopping vampire crossover artist who came to this uncharted Collinwood accidentally on purpose and can’t figure out how to leave. Quentin and Barnabas have been in the east wing, taking a peek through the veil, and they saw some Regular Time people discussing their Regular Time concerns, like where do you think Barnabas went. Quentin’s been mulling it over all the way downstairs, and by the time they hit the drawing room, he’s ready to deliver his verdict: Barnabas is the Barnabas they’re talking about in that room. Obviously this is the case, because the multiverse is big enough to hold several Brunos and anywhere up to five Sabrinas, but the good Lord only made one Barnabas. But Barnabas decides to bluff it out, because they still haven’t developed the technology to determine whether somebody’s Parallel or not. He says that he’s not the Barnabas from the room, and Quentin’s just going to have to take his word on that. So Quentin shrugs and says okay, but it’s a weird coincidence, and Barnabas says that it certainly is. And there you have it, a pleasant and perplexing slice of afternoon television that accomplishes nothing of consequence. So at this point I feel obliged to remind you that this is a horror story about a dead woman returned to life, a reckless revenant who got woke thanks to some body temperature stolen from the living. When she feels the chill of the grave, then it’s time for another sacrifice, sucking all the heat out of somebody in order to perpetuate her blasphemous existence. But she hasn’t done that in a while, and nobody’s mentioned it, so I guess at the moment it’s fine. I also feel obliged to remind you that this is a murder mystery story about that same ghoul, who was murdered with a hatpin six months ago, and she wants to know who done it so that she can do it right back to them. So far the list of suspects is essentially nobody, and there are no motives and no clues. And finally, I feel obliged to remind you that this is a love story about, yes, the same dead lady, still desperately in love with her husband, who remarried while she was dead, without asking for her permission. She either wants to remarry him or murder him, or possibly both. She hasn’t been super clear on that. I feel obliged to do all of this, because the next thing that happens is that Angelique walks into the drawing room with an armful of flowers. So: really? For some reason, they’ve decided that Angelique has this insatiable interest in botany. They made a big point about it with Alexis, because it was supposed to be a clue that Alexis was Angelique, but then they said no, Alexis is interested in plants too, so maybe it’s Alexis, which it was. But now that Alexis actually is Angelique, she’s still interested in plants, which means that she’s constantly gardening, rather than doing something to advance any of her three stalled storylines. I mean, yeah, it brightens up the sets, and it’s fine if they want to give people some non-plot-related character traits, but at a certain point, you want the character to knuckle down and remember that she’s a terrifying unstoppable succubus hellbeast, and maybe dial back on the extracurricular activities. Anyway, Angelique says that a package arrived for Quentin from Paris, and the butler put it in the study, which is not the kind of “the butler did it” moment that we’re looking for, at this stage of a murder mystery. So Quentin says, “Barnabas, will you excuse me?” and Barnabas says, “By all means, I must be going myself,” and then Quentin leaves the room, and Barnabas doesn’t. 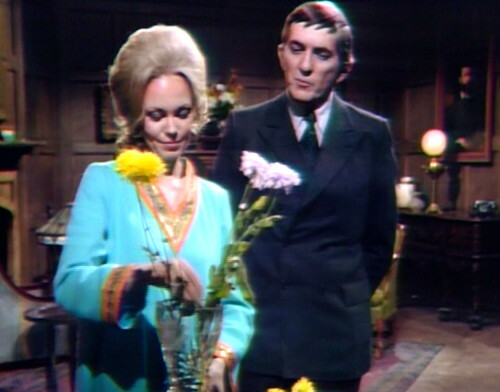 Instead, he hovers around Angelique’s airspace, while she continues to mess around with flowers, and they have an extremely Dark Shadows discussion. Angelique: I was born right here, in Collinsport. Barnabas: Now that you’re back, do you plan to stay? Angelique: Quentin has asked me to, temporarily, and I’ve agreed to. Why? Angelique: Now, why should you be curious about me? You only met me this evening. Barnabas: Well, maybe it’s more than just mere curiosity. You see, I couldn’t help thinking about your sister’s death. Which is par for the course, really, in Collins family conversation. This is how Barnabas flirts. Barnabas: I was wondering if your presence here indicated that — well, that Quentin had gotten over his wife’s death. Angelique: Or that he wanted me here to remind himself of her? Angelique: Well, I’m afraid that both of your guesses are inaccurate. Also, what are you talking about, and how is this your business? she doesn’t say, and then she keeps on fussing with the flowers. Once Barnabas finishes talking and actually leaves the room, the camera lingers on Lara Parker, who has to come up with an appropriate facial expression and has been given precisely nothing to work with. So she kind of looks off into the distance and flickers her eyebrows, as if to say, I might be feeling something about that conversation. But what? 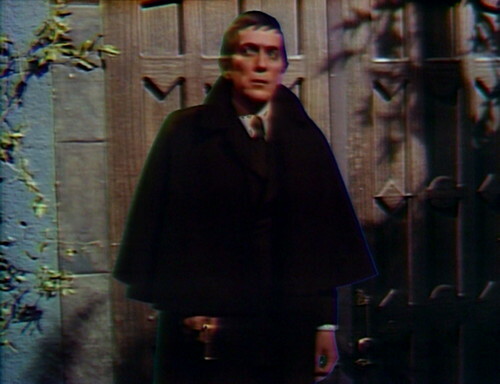 Meanwhile, Barnabas goes out onto the front porch and turns into Chromakey, for a brief thinks monologue. And then he changes the subject, because that doesn’t actually make any sense. This is clearly not the Angelique that he knows, and he doesn’t need to find out about her, soon or otherwise. This is local politics, there’s no reason for Barnabas to get involved one way or the other. 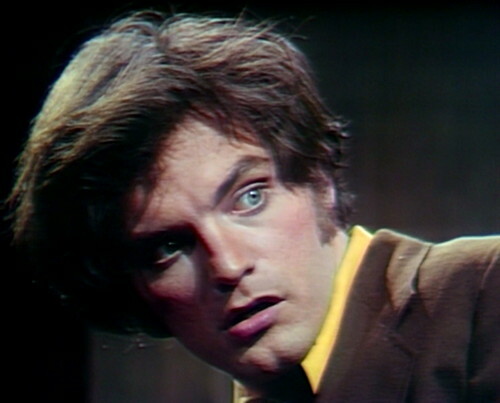 So this raises an interesting question, which is: Is Dark Shadows Doctor Who? Because this is a moment when Barnabas may be adopting a new role in world affairs. He’s stranded in Parallel Time, cut off from his friends and family in his home dimension. But at the moment, nobody in Parallel Time is giving him any problems, and all he needs to do is figure out how to pass through the time barrier and get back home. Whether Alexis is Angelique or vice versa is not germane. So that’s why I’m asking: is Barnabas the Doctor? Does he feel the need to solve other people’s problems, in whatever time and place he happens to land? I mean, he’s been sticking his nose into lots of things for a while now, but usually it’s related to some personal dilemma like how do I get Quentin to not kill my friends or how do I get the Leviathans to leave my dead girlfriend alone. In this case, the Angelique/Alexis question has no connection to anything Barnabas cares about, and the only reason he’s concerned about it is that he’s the main character and he should probably get involved in the current storyline somehow. But nothing is really connected to anything at the moment, because Angelique can’t figure out what she wants. She’s smiling, and it seems genuine — she’s not on assignment right now, she’s just legitimately curious about Quentin’s mail. This is a nice, light moment that I would appreciate a lot more if there was anything else to contrast it to. What is she doing? I know, I’m just hassling Angelique today, but this isn’t idle nitpicking. There is a fundamental question here about what the main antagonist on the show is actually trying to do. What does Angelique want? Does she want to reclaim her old role as mistress of Collinwood? If so, then she appears to have a blank check, as far as living in the best suite in the house and carrying flowers around from one place to the other. If this is what she wants, then she has it, story over. So if this is a story where we don’t understand what the hero is interested in, and we don’t understand what the villain is trying to accomplish, then what’s holding the show together, besides the innocent pleasure of watching Jonathan Frid, Lara Parker and David Selby talk to each other? They finally do narrow down the options to a specific story point for the day, and guess what, it’s none of the above. She’s not a heat-sucking ghoul today, or a murder victim. She doesn’t want revenge on Quentin for choking her or burying her or whatever she’s angry at Quentin about. Instead, she’s running a therapy group for Quentin to work out his problems with Maggie, his runaway wife. Quentin: She wouldn’t answer my telegrams, she would never come to the phone when I called… What more can I do? Angelique: You can try again! Angelique: Quentin, you can’t go on torturing yourself like this! Quentin: I’m not torturing myself! Angelique: Yes, you are! You think of no one but her, you miss her much more than you’re willing to admit! And maybe he does, but he’s not going to call her, and it seems like he’s fine with letting things drift away, so who cares? Maggie’s not here. Quentin says he doesn’t want her. What is Angelique looking for here, and how will she know when she gets it? Also, how is this a thing that a dead person does? But apparently we’re trapped in some kind of Erica Kane bad-girl double-agent shell game where Angelique pretends to be supportive so that she can tear her rival down. And then, believe it or not, she uses her amulets and herbs to cast a love spell on Quentin, forcing him to fall even more deeply in love with… hang on. What? And then, somewhere in the afterglow, Quentin receives her message and falls even more deeply in love with Maggie, which seems entirely counterproductive. But, sure. Why not? Pull up a spell and cast away, Angelique. We’ll get somewhere, eventually. Tomorrow: Are You the Quentin. In act 1, there are a couple glimpses of a camera in the foyer. When Quentin says “yes, I suppose you’re right,” you can see the camera moving through the crack in the doorframe. 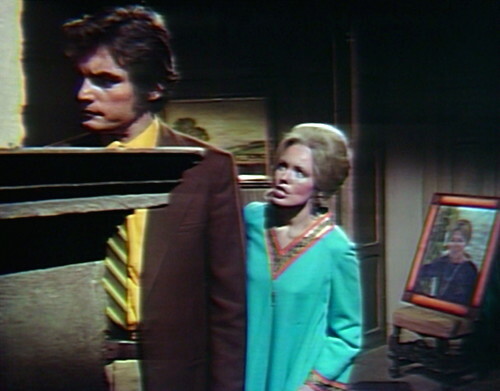 A moment later, when Barnabas says, “I understand…” you can see the camera as he strolls past the door. Barnabas asks Quentin what his first wife’s name is, but Quentin already told him yesterday. 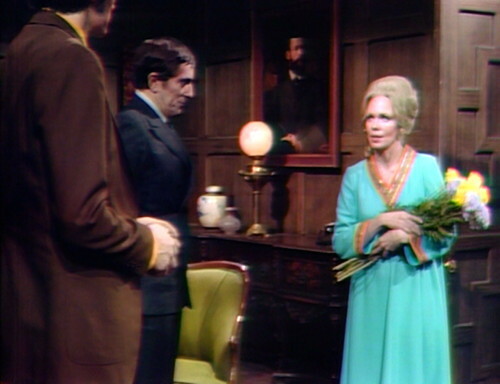 When Angelique enters the drawing room carrying flowers, a crew member holding a script crosses behind her. The music cue at the end of act 1 starts while Angelique is still speaking. When Barnabas hypnotizes Daniel, we can see the vampire’s reflection in a mirror. The Ralston-Purina lamp appears again today, in the study, or whatever that room is supposed to be where Quentin talks to Angelique about Maggie’s portrait. We last saw the lamp a month ago, at Hannah’s place. Maggie’s portrait uses the frame that Angelique’s original portrait used, back in 1968. Is this Hannah’s last episode? I’m going to miss her. She was smart to get away from Collinwood, though, because it spared her from the typical Dan Curtis bloodbath at the end of the PT story. I met Paula Laurence (Hannah Stokes) at a Dark Shadows Festival in the early 1990’s. She was very nice to her fans, and I wish she was still around. She’s only here for a few more episodes. And yes, she’s a great character. Just speculating here – I think I probably would also have enjoyed seeing how actress Clarice Blackburn (who played Mrs. Johnson, Abigail, and Minerva Trask) might have played the role had they cast her as Hannah in Parallel Time 1970. I actually thought her and Clarice Blackburn could have been sisters and I thought they were the same person initially. Hannah was not there but for a minute. Sorry they didnt cast her in another role. Regular Time? That’s what we used to call it on the old message boards, though its origin probably precedes that. We could say, “Non-Parallel Time,” but that wouldn’t really be true; both timelines are parallel to each other. Besides, it would make me hungry for nonpareils. I do want the parallel time storyline to wrap up, but then will dread seeing my DS actors back in the 1840 period costumes. I thought Julia looked amazing in the 1890s clothes. I don’t remember the 1840s costumes much except for the dark blue velvet dress Nancy Barrett wore. She looked incredible in that thing. I remember a lot of women being in that same ghastly orange color that Samantha wore from sausage curls to hem. The men fared a lot better in their snug Beau Brummel trousers and i’ve-got-more-ruffles-than-you-do shirts. Quentin and Barnabas could have had a competetive ruffle-off, but they’d have ruffled off all the way past Buffalo and into the canal. Edith only one dress. This green one. I swear I never saw her in any other dresses. Julia seem to choose really nice costumes during her PT times. There was one dress I didnt care for but for the most part hers were very stylish. So were Joan’s as well. Curiousity is the Doctor’s defining trait — more so than heroism. Sure, he sets out to do the right thing but what compels him to stay someplace obviously dangerous and investigate is his need to solve the puzzle. This translates well to Barnabas, a star of a daytime soap, where “busybodiness” is a defining trait of many protoganists. This is also when he and Julia are at their peak relationship wise — just two girlfriends busybodying up a storm. BTW, I think Barnabas as a character benefits when he shares traits from Professor Stokes. The playful jousting between Barnabas and Angelique here is very much something you’d imagine Stokes doing. I think it’s ideal for your series “hero” to have the twin traits of eccentricity and curiousity (Stokes was far more engaging than Barnabas during 1968). Barnabas Collins shouldn’t be someone who wants to “live a normal life” (my god, those scenes of him reading by the fire in 1968). Dramatically, that means your hero wants to be dull. He should be someone whose busybodiness leads him to one crazy situation after another… oh, and he’s also a vampire. I think it goes even beyond curiosity with Barnabas. He seems to have this need to fix everything and make sure everything is as he thinks it should be before he moves on. He’s not Joshua’s son for nothing. 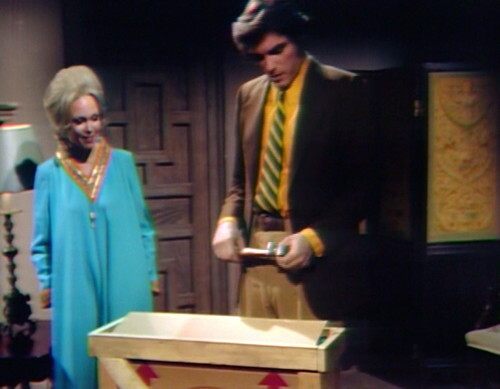 Even more amusing are the points when Barnabas suddenly finds himself back in the real time room of the East Wing, back home safe at last, where real time Julia joins him for a recap. And those moments should be the end of it, right? Barnabas is back, no longer trapped by Will Loomis’ revived literary ambitions, no longer beholden to anyone “there”. But, no. Maggie is in danger in that “other” time, he’s got to find out about this “other” Angelique. So he’s got to go delving back into that “other” time band. It’s really a device, the show telling us that, Yes, we must care about these “parallel time” characters and what happens to them, because the only interesting thing about real time 1970 to Dan Curtis is golf and making his next movie. Reminds me of STAR TREK’s “Mirror Mirror” episode. It wasn’t enough for our heroes to return to their own time — they ust HAD to save the Halkans, too — AND try to make the “evil” universe just a little bit “nicer”. A most amusing and astute observation, Prisoner [shaking my head, laughing]. I wish it were not a true statement, but alas I believe you hit the mark. A bulls-eye! I know a way that Dan Curtis could have been kept interested. Adapt the story around his favorite sport. Strange events begin occurring 100 years after Sumner Collins built the Collinsport Country Club. For some reason, golfers start to go missing before they get to the 18th hole. Bring on the crack detective team of Barnabas and Julia to investigate, and with the help of Professor Stokes they find a time warp in one of the sand traps leading to 1870. It turns out that Sumner Collins built the club, knowingly, over an ancient Indian burial ground. Can Barnabas and Julia right the sacred wrongs of the past before the vengeful spirits re-emerge in 1970 to seize the township of Collinsport, or at least the grounds of the country club, away from the White Man and return it to its tribal origins? Call it PG (Parallel Golf). That would be enough to keep Dark Shadows running until 2005 at least. I’d better get some I Ching wands and project back to 1970 so I can leave a copy of this post on Dan Curtis’ desk. Maybe I’ll even land a role as an extra on the show or, better still, a job on the writing team. I’ll let you all know how it goes when, and if, I get back. And it’s already been established that Carolyn, at least, has played golf at the Country Club, because Tony Peterson said he was her caddy when she first learned. Prisoner, was that a John Belushi, “But, noooooooooooooo!”? I just find it amusing how they can hop back and forth from PT to RT, which wasn’t done, or didn’t seem possible, in the previous time travel stories. By the way, I wonder what happened to the Sam Evans of parallel time — maybe he was the one Roger Collins ran down that night. I don’t believe Angelique is desperately in love with Quentin. She just desperately wants to control him. She’s jus tlike all the other soap vixens in that she wants the man who is most off limits to her. And it helps if he’s rich – you don’t see too many vixens going after the working class guys, no matter how hunky they are. Pola Debevois: I want to marry Rockefeller. Pola Debevois: I don’t care. -from How to Marry a Millionaire. Since “present time” is every changing, how about Collinsport-Prime? It’s true that Barnabas’ concern for other people and their problems is very often personally motivated, but there are exceptions. Stepping in to stop Elizabeth from jumping off Widow’s Hill would have to be an early example of this. Sticking around in PT is harder to fathom because he certainly has no prior relationship with any of these people. He’s also in danger of being found out. Idle curiosity about PT isn’t enough of a reason to hang around. On the other hand I think Barnabas’.experiences with the Angelique have colored his perception of ANY lookalike. And even if he’s wrong he’d rather not let her have any wins in her column and stick around to make sure it happens. Other reasons (and excuses) come up in PT for Barnabas to stick around, but at this point..? Well, sometimes I think that Barnabas might end up channeling Felix Unger and trying to fit the world into his mental scheme. Agreed, the PT people aren’t Barnabas’ “real family”, and this bunch have kept him locked in his coffin for weeks. I’m thinking that his main interest there is in using them as a fresh blood supply, so he doesn’t hurt any of the “original” Collinses (who also don’t seem to have any pressing issues at the moment – no ghosts, witches, currently no vampires, even the werewolf got fired, haven’t seen the Frankenstein monster in years; unless somebody loses a pen or David takes up auto repair again, Collinwood is just your average mansion. Maybe Carolyn could join a cult). I wanted Barnabas to leave PT because I wanted the story to be done; but I have to admit that if I somehow ventured into parallel time and saw some of my parallel family members or friends in serious danger, I’d want to try to help them if I could. He offered to free Ben Stokes from indentured servitude. He agreed to marry Angelique if it meant saving Sarah from death. One of the things I LOVE about 1907PT is that finally Barnabas is acting like his old self. He doesn’t need to do a damn thing for these people. But Barnabas decides to help not only because he empathises with them, but maybe because he has finally internalized Sarah’s lesson: “That evil is wicked, is well understood. The wicked are punished, so you must be good.” Barnabas has come a long way from the disconnected psychopath who abducted Maggie Evans. Sarah would be proud. As for purely selfish motivations, Barnabas is attracted to “Alexis.” He says as much to PT Quentin. Perhaps she reminds him of Angelique’s better qualities from the nights spent at Martenique. Basically Angelique without the crazyface. But something is naging at Barnabas that “Alexis” is not what she appears to be. He would need to clear up the identity issue so he can proceed to court Alexis. I maintain that PT was the “do over” of 1967 for Barnabas. He is thrust in the very much the same set-up he was then, but he makes different decisions. Also, it is to be noted that there is no talk of vampire attacks. He has also learned how to fly under the radar – If he handles his other victims like he handled Buffy, then he can remain undetected for quite a while. Yes, in every reboot (1897, 1970 PT, 1840), Barnabas arrives to a world of intrigue. Unfortuately, 1991 DS stuck to the HODS/1967 formula where Barnabas himself was the sole intrigue. I agree that the “old self”Barnabas is coming through in PT 1970. And more of his “fixer” tendencies. Actually I think that they are trying to blend the Barnabas of 1967 and that of 1968 (butler Barnabas). Which is what happens when writers do not have a clear idea of what to do with him. Barnabas has been out of it for a short while. He’s missed all the Maggie made to feel unwelcome, Alexis identity confusion and Damian Edwards stuff (lucky sod on that last one). He isn’t even aware of the murder investigation. To be fair, only Alexilique is interested and that’s not even half the time. And that’s not even touching upon John Yaeger, whose largely been separate from the Collins family. It’d be interesting only watching episodes with Barnabas, and trying to work out what’s been happening along with him. His absences at the end of 1897 and start of 1970 PT would be fascinating from this perspective. Before I forget, Barnabas is also beginning to use his powers more humanely. In the scene with Daniel, Barnabas simply hypnotizes him to forget he ever saw Barnabas so that he could not report any suspicious activity to Quentin. Barnabas could have easily killed or turned Daniel into one of his blood-slaves. When he has that quick discussion with Julia, doesn’t Barnabas tell her he has to go back to the other time to help Maggie? I always got the vibe that he and Josette/Maggie were such soul mates that their bond transcended all time. 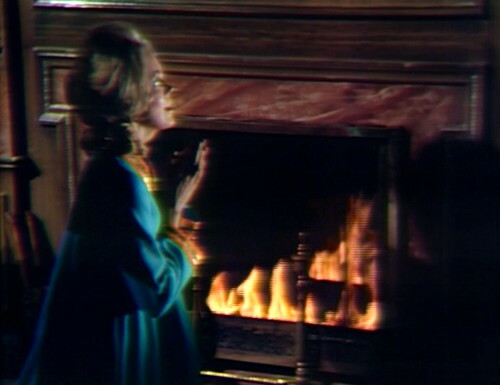 PT Maggie in danger is the only reason Barnabas has for wanting to go back there that rings true. PT Maggie is basically the same as Maggie. Apart from minor back story, and the fact that she married Quentin. Out-of-sequence question: I’ve been revisiting some much earlier episodes. Just a quick refresher from the hive mind, please? : was Thayer David the first actor to play more than one role in a single DS timeline–Matthew Morgan and then Professor Stokes in the 1960s? Much of the series is time-hopping actor-doubling, like an endless costume party, but within a single timeline, I’m guessing David was one of the few, and may have sparked the idea: he would later play Sandor and Petofi in 1897. Back in the main timeline, by a soap-cliche slight of hand we got twin Jennings brothers played by the same actor, Roger Davis dizzyingly recurring as Jeff Clark/Peter Bradford then Ned Stuart and then, much later, a superannuated Charles Delaware Tate, while Marie Wallace started as Eve and returned as Megan, and, of course, later, in PT, Chris Pinnock did DS’s own Jekyll and Hyde and Lara Parker was her own twin. (I’m not counting Angelique showing up in various guises in the 1960s timeline–a ghost, a vampire, a millionaire’s wife, because it was always still Angelique, and not really counting the special case of character transformations under Petofi in the 1897 section–Charity Trask inhabited by Pansy Faye, Edward turning into a butler, Jamison into Petofi, etc.) Am I right in thinking that Thayer David was the first in this sequence? Based on the criteria provided here, I believe that honor goes to Vince O’Brien. He played Lt Dan Riley in 1967 and then became one of the 4 Sheriffs Patterson. The scene where Quentin unwraps Maggie’s portrait is remarkably similar to a scene during 1795, where Barnabas is unhappily married to Angelique and receives a portrait of Josette. In both instances the husband feels a pang of sadness at his love’s absence, which is picked up on. There’s even an Angelique in the room when it happens. In this episode it’s her who picks up on it. Meanwhile Angelique once again casts a spell to make Quentin desire Maggie. Also, as Maggie’s portrait comes out of the box, it looks like it’s wrapped in one of Daniel/David’s blue bedsheets.